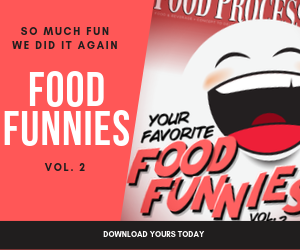 July edition of Food Processing's Food Funnies, a monthly feature guaranteed to give you a good laugh. Congratulations to Kristina Hoeller for the winning June Caption! Never seems to fail, same as the check out line… why do they always put the bread in the bottom of the cart?!?! I think it’s the Higgs Boson ‘God Particle’ everyone is talking about. Wow, they weren't kidding when they said that FDA had their eye on us! Drat, I blinked! I lost the staring contest again! Yup, it's just another day at the magic bean factory! I know it's a poster, but I swear it moves. Do you get the feeling that somebody's always watching us? Sure hope this includes 20-20 vision. I don't get why the FDA keeps watching us, these animal hearts we process fall under USDA jurisdiction. Hey nice poster they sent us”, “too bad the it was printed in China and isn’t compliant. Well, at least Big Brother isn't flying its drones in our building! I was skeptical when they claimed a larger presence while cutting back on inspectors, but this works for me.